Ideally located in the heart of Paris at the center of the most chic districts of the Capital. 2mn. walk to the most beautiful avenue in the world: the Champs-Elysées. Close to the finest delicatessen stores at Place de la Madeleine. Only 1mn. walk to the Presidential Palace and Rue du Faubourg St. Honoré with all its Haute Couture stores (Chanel) as well as the jewellers of the Place Vendôme (Cartier) and Galeries Lafayette. 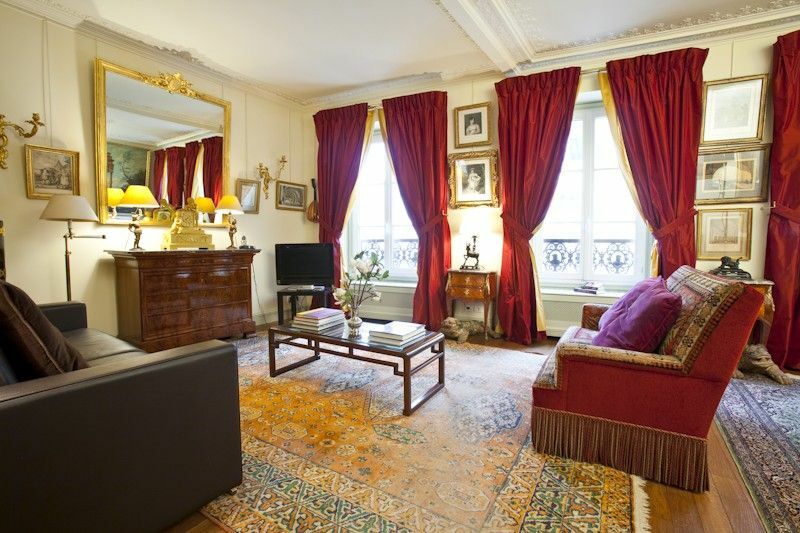 This very beautiful, elegant and peaceful apartment is tastefully decorated with 18th century furniture and will provide you a comfortable and restful stay in Paris. The building is well kept, has security-controlled access, and is located on the 3rd floor with an elevator. The apartment was completely refurbished in 2012 and is fully equipped and modernised with a brand new kitchen. A very comfortable queen-size bed and extra luxurious queen size sofa-bed. A complementary bottle of Champagne will be provided upon arrival. Your stay will be an unforgettable one. Upon your arrival we will provide with a full list of the great places, likes restaurants, grocery stores, bakeries etc that we do recommend. The apartment cab be booked for a business trip or for a romantic or family holidays. Hints & Tips: You will be staying 5 minutes walk from the Champs-Elysées. Close to international Auction Houses like Christie's and Sotheby's and the best Art dealers in the world. Museums & monuments : Palais de l'Elysée (1 min walk), Petit et Grand Palais, Musée Jacquemart-André (5 min walk), Palais de la Découverte (7 min walk), Le Louvre (40 min walk), Les Invalides, Arc de Triomphe (15 min walk), Musee d'Orsay, Tour Eiffel and Trocadero (40 min walk). Parks & gardens for a walk or jogging : Parc Monceau (5 min walk), Jardins des Champs-Elysees (3 min walk). Theaters & shows: The mythical theater l'Olympia, L'Opéra Garnier, Theatre Marigny, The Lido and the Crazy Horse (10 min walk). Cinemas : Over 40 cinemas on the Champs-Elysées most of them are in English. All of these places can be accessed by walking or by renting a bike in every corner of the city. You will have also access to free international calls to over 107 countries and Free Wifi in all the apartment since we have optical fiber. Best Points: This luxury apartment with 2 separate bathroom is conveniently located in the chic 8th arrondissement-Golden Triangle of the city, nestled on a quiet, mostly residential street . Close to the finest delicatessen stores: Hédiard, Fauchon and Ladurée at Place de la Madeleine. 1 minute walk to the Presidential Palace and rue du Faubourg Saint-Honoré with all the Haute Couture store like (Hermes, Chanel, Christian Dior and Gucci) as well as the jewellers of the Place Vendôme (Cartier, Harry Winston). 10 minutes walk to the French Department Stores (Galeries Lafayette and Printemps). You will find as well few minutes walk from the apartment the best night clubs in town: Regine, The Queen and V.I.P. (avenue des Champs-l'Elysées). This apartment can be used as a holiday heaven or for a business trip. We will provide you a list with all the excellent restaurants and bakeries in the area. Cross ventilation will keep you always at the ideal temperature. Means of Access: Tube station : Miromesnil (30 seconds walk from the flat) line number 9 & 13. Champs-Elysées and Franklin D. Roosevelt (5 minutes walk) line number 1. Buses: Just down the flat, use number 32 and 52 plus 4 more other bus lines. Bicycles for rent called Vélib are 50 meters from the flat on Avenue Matignon, by the Bristol Hotel. Air France shuttle buses : At Porte Maillot by Le Méridien Hotel or Invalides, will take you directly to the Charles-de-Gaulle airport or Orly airport in 40 minutes, depending on the traffic. The EUROSTAR train Station Gare du Nord is only 10 min from the house by taxi or 15 min by tube. The RER A train will take you and your kids straight to Eurodisney Paris. If you drive to Paris, you will have available parking slots at 2 minutes walk from the apartment. (To see more pictures, please, do not hesitate to contact owner for website link or further details and information). Come and see me and then we will discover each other...and share our travel experiences. Because is the best in Town and we are good are making sure you will have the best time in our apartment !!! You will be staying In the most prestigious area of Paris just next to the Presidential Palace. You will be treated as a first class nestled in a unique luxurious 18th century atmosphere. Both bathrooms are luxurious in marble from Italy. Both are brand new. Hair dryer and iron domestic are available. A dry towel heater is in the main bathroom providing you an extra comfort. Couples can take showers and bath at the same time without any problem. The bathroom is new and very contemporary with a touch of Italy. There is a very good separate shower which consists of two body jets, and an over shower, as well as a hand-held shower nozzle - all which can be operated independently of each other or together. This shower is a marble enclosure with a glass door. The bathroom is well lit with halogen lighting and the bathroom wall is well mirrored. The WC is independent from the shower. High Speed Wireless in all the apartment. We have now fiber optic, the fastest internet service in the market today. We have 2 ovens Smeg. Tea, coffee and few spices. You can cook at home or have a chef coming and prepare for you or order as well. Over 600 channels and a zillion languages and radios. I Pod Station, Radio and DVD player. Many guides of Paris and France as well as maps. An few novels and Art books. On the River Seine for diner or just a ride. You can provide a home massage several times a week in the apartment done by our professional team. The apartment has been completely redone in 2012 and fully equipped with all the modern comfort: a brand new kitchen (a traditional oven and a micro wave oven SMEG, a dish washer SMEG, a washing and drying machine SMEG, a big refrigerator with a deep freezer MIELE). An authentic wooden oak wooden floor and Persian carpets. A toaster, A Nespresso coffee machine and what else !! A boiler, a toaster and all the necessary dishes you will need for cooking all sorts of dishes and have guests to come over. The apartment is very quiet and in a very residential, central and luxurious street. You will have Internet ADSL and WiFi access in all the flat; TV Philips LCD (flat screen) by cable with more than 200 channels in French, English, Spanish, German, Arabic, Russian RAI, CNBC, Sky News, TVE, GloboTV, Bloomberg, DW TV, etc.. You will have free telephone calls to over 110 international destinations as well as France when calling to land lines. We can provide you with a daily maid service. Beautiful property and very accommodating host. It is in the heart of the 8th and you can walk to lots of key sights as well as restaurants, shops, etc. The place looks like something out of a classic film set in Paris! Thank you, Joseph. Glad to have found this lovely, spacious, quiet, comfortable, well-equipped, -furnished, and -maintained apartment in the luxe 8th. Central and convenient location near transportation (metro and bus) and shopping on Champs Élysées and surrounding streets. We would happily return here on future visits. Pluses: large eat-in kitchen with quality full-size appliances (and Nespresso machine! ), very large well-decorated living room, comfortable bed in master bedroom, adequate closet space in bedroom and living room, two bathrooms (master bath tight on space), nice rainforest shower, plenty of hot water, elevator, good building security, great neighborhood. Owner representative met us and explained operations. Minor negatives: glitch with alarm system (low battery on a sensor?) meant sporadic beeping during two different nights (muffled that with pillows -- didn't interfere with sleep), heavy incense odor on arrival (eliminated problem by by stowing the dozens of incense sticks in a drawer and running a little water into shower drain trap), towels apparently not tumble-dried (stiff and scratchy), elevator very small (typical for older Paris buildings). FYI: on the weekends before and after (but not during) our visit (late Dec - early Jan), the "gilets jaunes" protestors were demonstrating and/or rioting in Paris. The apartment is near the Élysée Presidential Palace, so during our stay, heavily-armed but friendly police were posted at nearby corners. Steel barricades were stored on sidewalks at every intersection, ready for deployment but not used. Banks of armored personnel carriers were parked near major squares. A few luxury store windows were plywood-covered. Fortunately, restaurants and museums were all open and busy, and evenings on the Champs Élysées were marvelously crowded with thousands of eager tourists and peaceful locals. Trouble has been confined to Saturdays, so we elected to not cancel our visit, and are glad we came! Recommendations nearby: restaurant À la Châtaigne (Corsican) a half-block east -- wonderful cuisine and service, moderately priced; Musée Jacquemart-André, a mansion a few blocks to the northwest with rotating special exhibits. Wonderful apartment and warm hospitality! We had a delightful stay in this lovely, clean, well-maintained apartment in the heart of the 8th arrondissement of Paris. From before our arrival, the communication with the owner and staff was excellent, responsive, and helpful. We received proactive communication to encourage our safety with the recent demonstrations, which we did by spending the day very comfortably and safely within the residence.. We had no difficulty with access to the apartment or to transportation from there to other sites around the city. We look forward to staying here again in the future!! This apartment is beautifully appointed with antiques with an up to date fully equipped kitchen. It is located in a quiet area, close to major attractions with a nearby metro station. We did not meet the owner Jacob, either at the beginning, or during our stay and felt as a consequence that the handover when we arrived was not as informative as we had been led to expect. We were left to puzzle out a few things on our own. For example in the refrigerator and on the kitchen bench there was a range of wine and beer and a schedule listing the individual bottles and their price. When we checked we found there was little correlation between the schedule and the actual bottles of wine in the apartment. This caused us some unnecessary concern. We enjoyed the apartment and just feel the meet and greet could have been better managed. The apartment is in a very nice, quiet, safe area of Paris. Many nice restaurants in the area. Easy access to the Metro to get around Paris. Bedroom is in the back of the apartment on a quiet courtyard - conducive to a restful sleep after a long day of sight seeing. Apartment is very clean and comfortable. Joseph and David were very responsive to our questions both before and during our stay. I highly recommend this property for your stay in Paris. The apartment is appointed so thoughtfully---and comfortably---it creates the ultimate dilemma; do we enjoy Paris lounging in the apartment, or get out on the streets that is the reason we came to Paris in the first place. If there is only one word to describe: Gemütlichkeit. A unique gem. Tube Station: Miromesnil (30 sec walk from the flat) line 9 & 13. Champs-Elysées and Franklin Roosevelt (5 min walk) line 1 - Buses: pass by the apartment, numbers 32 & 52. Bicycles for rent called Vélib are 50 meters from the flat on Avenue Matignon. A taxi stop 50 meters from the house on Rue du Faubourg St.-Honoré - Air France shuttle buses (At Porte Maillot or Invalides) will take you directly to the airports. The RER A train will take you straight to Eurodisney Paris. If you drive to Paris, you will have available parking slots just 2 minutes walk from the apartment. You will be staying a 5 min walk from the Champs- Elysées. Plenty of excellent restaurants. Monuments: Grand Palais (6 min walk), Les Invalides (15 min). Parks for a walk or jogging : Parc Monceau (7 min). Theaters: l'Olympia, L'Opéra Garnier. Cinemas : over 40 cinemas on the Champs-Elysées - most of them with English movies playing. All of these places can easily be accessed by walking or by renting a bike.